Welcome to the website for the Glenn Highway, MP 53-56 Reconstruction Project - Moose Creek Canyon. The Alaska Department of Transportation and Public Facilities (ADOT&PF), in coordination with the Federal Highway Administration (FHWA), plans to re-align and straighten this three-mile section of the Glenn Highway and construct a new bridge over Moose Creek. This project will increase roadway safety and accommodate anticipated traffic for the next 20 years. Currently, the Glenn Highway has a steep grade and tight curves between MP 53 and 56. Due to Moose Creek Canyon’s unstable gravel slopes, rockfall is also an ongoing issue on the roadway. These undesirable features, along with associated maintenance challenges, have made this project a priority for the State of Alaska and Matanuska Susitna Borough. The proposed realignment of a three-mile section of the Glenn Highway will require a new bridge over Moose Creek, approximately 2,800 feet downstream from the existing bridge. The proposed roadway will leave the existing highway on the west bluff of the canyon and rejoin the existing alignment on the east bluff. 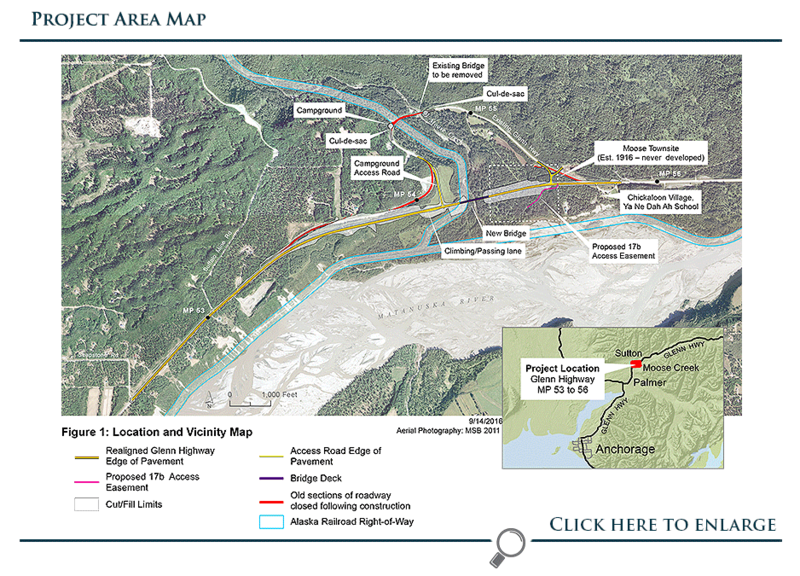 The roadway will be widened to two 12-foot lanes and two 8-foot shoulders, and an Anchorage-bound passing/climbing lane will be added west of the proposed bridge.